Trade and commerce: For massive production and sale mass communication helps through wide circulation and publicity facilitates the organization to reach these objectives in comparatively less time and expenditure. Social affairs: Mass communication also helps to advance our social affairs. Unexpected sufferings of people are sometimes caused by severe drought, a terrible flood, war or any other natural calamities others will be known rapidly through mass communication and take quick decision. Human resources management: By the help of mass communication, semi skilled workers become skilled and fit for the target job which is a scope of mass communication also. Political affairs: It has power for access to political affairs. To form public opinion on some important political issue, political parties convey their feelings and arguments to the general public through mass media like television, newspapers etc. Even international politics also influence largely by mass communication through electronic media. State business: The annual plan, policy, program and procedure of a state are circulated through mass communication and communication ministry of a state performs a vital role here and uses various electronic media to serve their purposes. 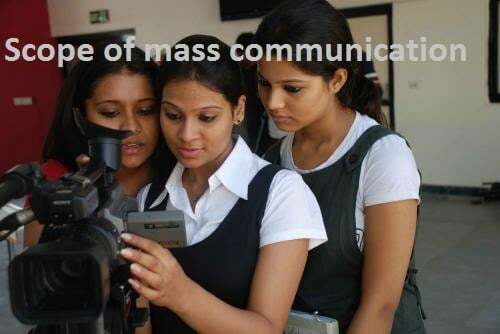 Education: Education is another area where mass communication is widely used. The mass education programmed undertaken by the Govt. Is being vigorously conducted through television, radio and newspapers. In recent years we have witnessed an unprecedented growth in the field of mass communication that why scope in the field of mass communication is vast.